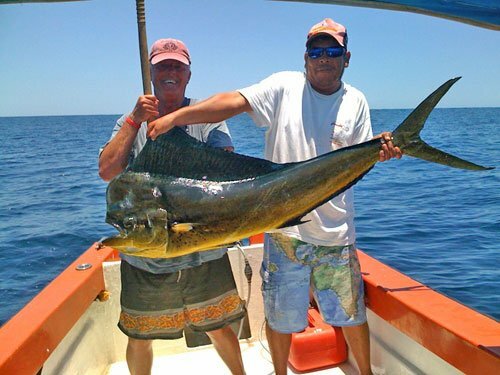 Mahi-mahi are highly sought for sport fishing and commercial purposes. Sport fishermen seek mahi-mahi due to their beauty, size, food quality, and healthy population. Mahi-mahi are popular in many restaurants. Mahi-mahi can be found in the Caribbean Sea, on the west coast of North and South America, the pacific coast of Costa Rica, the Gulf of Mexico, the Atlantic coast of Florida, Southeast Asia, Hawaii and many other places worldwide. Fishing charters most often look for floating debris and frigatebird near the edge of the reef in about 120 feet (37 m) of water. Mahi-mahi (and many other fish) often swim near debris such as floating wood, palm trees and fronds, or Sargasso weed lines and around fish buoys. Sargasso is floating seaweed that sometimes holds a complete ecosystem from microscopic creatures to seahorses and baitfish. Frigate birds dive for food accompanying the debris or Sargasso. Experienced fishing guides can tell what species are likely around the debris by the birds’ behavior. Thirty- to 50-pound gear is more than adequate for trolling for mahi-mahi. Fly-casters may especially seek frigatebirds to find big mahi-mahis and then use a bait-and-switch technique. Ballyhoo or a net full of live sardines tossed into the water can excite the mahi-mahis into a feeding frenzy. Hookless teaser lures can have the same effect. After tossing the teasers or live chum, fishermen throw the fly to the feeding mahi-mahi.eco-w Once on a line, mahi-mahi are fast, flashy and acrobatic, with beautiful blue, yellow, green and even red dots of color.